The artist's illustration shows a close-up view of jets erupting away from the supermassive black hole at the center of a galaxy. 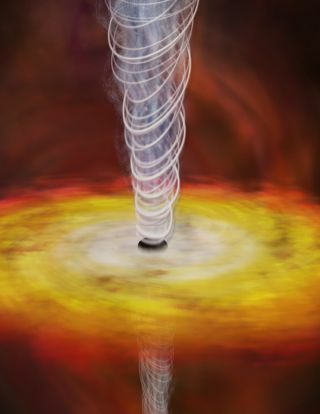 Scientists have now observers a rare flickering black hole jet that has them revisiting theories on the phenomenon. A close-up view of a rare, flickering black hole jet has scientist rethinking how these enormous eruptions form. Black holes are mostly known for gobbling up everything that gets near them, including light. But there are also jets of matter rushing away from many black holes — like cosmic fire hoses. Two years ago, the MAGIC telescope, located in the Canary Islands, happened to catch a black hole jet doing something very rare: It was flickering. Radiating from a black hole in a galaxy called IC 310, the jet was emitting bright flashes of gamma rays — the highest-energy light in the universe. The flashes would reach 10 to 100 times the normal brightness of the jet in a matter of minutes. The light show lasted just over three hours. "But we have found something very, very fast, and very, very small," said Dorit Eisenacher, a doctoral candidate at the University of Würzburg in Germany, and an author on the new paper. The new research shows that the portion of the jet responsible for generating the flares is five times smaller than what shock acceleration would require. In other words, say the researchers, the current theory doesn't cut it. "For most sources [the shock acceleration model] was working nicely. It looks like for IC 310 it does not work," said Julian Sitarek, an astrophysicist at the Institute for High Energy Physics (IFAE) near Barcelona, Spain, and an author on the new study. The researchers have an alternative proposal. When a star dies and collapses in on itself, it may become a pulsar: an incredibly dense, rapidly spinning nugget. Pulsars emit two bright beams of light, not unlike black hole jets. As the pulsar spins, the beams sometimes flash toward earth, and so the pulsar looks like it is blinking on and off. In 2011, another group of researchers proposed that a similar mechanism that drives pulsar beams could also generate flare events like the one seen in IC 310. Shock acceleration, as its name implies, would move particles with the physical force of a shock wave. Accelerating particles will radiate, so a sudden shockwave pushing particles up and out could also create gamma-ray flashes. Alternatively, particles are accelerated in pulsar beams by an electric field. This requires a much smaller area to get the particles moving. "We tried a few other scenarios, but each of them had some problems," said Sitarek. "The pulsar theory is a plausible explanation for what we saw." The details of how this mechanism might work in black holes will be difficult to sort out. Ideally, the team would like to have more data, from more black hole flares. But because the flaring events are short and unpredictable, it is extremely difficult to get telescope observations of them. For now, the researchers can only wait, but Sitarek is hopeful that black hole IC 310 has more to show them. "With this source, every time we look at it we get some surprise," he said. "Next time we look at this, maybe we get even bigger surprises." The new research is detailed in the Nov. 7 issue of the journal Science.